Well I must say the response to my new Existential Ennui permanent page, Beautiful British Book Jacket Design of the 1950s and 1960s, has been fair overwhelming. The link I tweeted to the gallery last week was retweeted to buggery – thank you to everyone who took the trouble to RT, especially Alexis Petridis (of The Guardian) and Margaret Atwood (yes, that Margaret Atwood) – with the net result that the page has received well over a thousand hits (er, make that 1,500... no, wait: 2,000... oh I give up) already. But it is, as I mentioned, an ongoing project, and so I'm pleased to announce nine new additions – some of them dustjackets by designers who are already part of the gallery – witness the Donald Green cover above – others by designers who heretofore haven't been, and still others that are brand new to Existential Ennui – bringing the total number of jackets currently on display up to thirty. 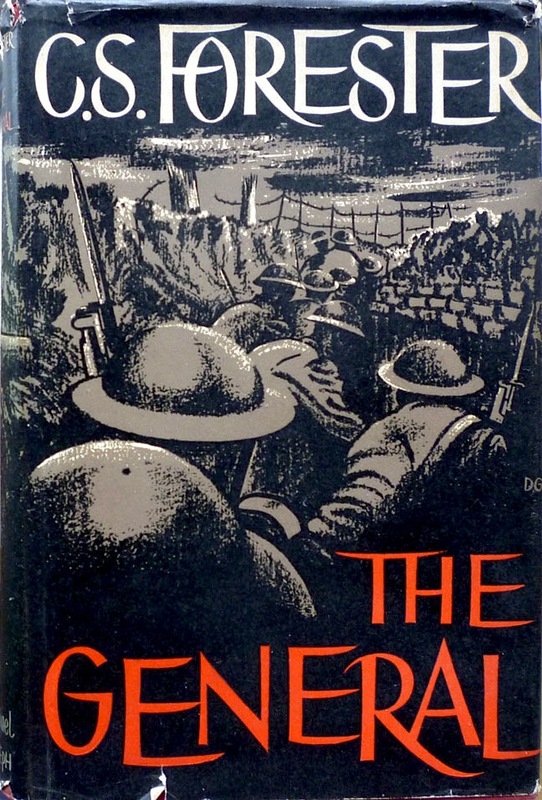 The above cover for C. S. Forester's The General may indicate that there are also a number of non-genre jackets in this batch, but that shouldn't, however, be taken as evidence that I've run out of crime or spy fiction wrappers to introduce to the gallery: I'm still mulling further additions from my collection, plus there are a number of books I'm keeping in reserve until I find the time to blog about them properly. (There are some nice surprises in store for regular readers, and I'd rather not spoil them.) There are also a handful of jackets which I've re-photographed from their original appearances on Existential Ennui (these are the lengths I go to for you, dear reader; I hope you're grateful). See if you can spot the new additions. Oh, that's a chilling book jacket. Isn't it, Peter? I'd actually been looking for a copy of The General ever since Anthony Price mentioned it when I interviewed him last year. And to find one with such an evocative jacket (in the secondhand bookshop Camilla's in Eastbourne) was doubly gratifying.